So, this is your opportunity to see this amazing band performing live.The rock band is comprised of original members Lee Lughnane (trumpet and vocals), Rober Lamm (vocals and keyboard), James Pankow 9trombone, Jason Scheff (guitar and vocals), Walt Parazaider (woodwind), Keith Howland (guitar), Tris Imboden (drums), Lou Pardini (vocals and keyboard and Walfredo Reyes. Chicago the band is undeniable one of the most popular bands in music history and is still going very strong, and is still performing very passionately and strong. Come listen to some of their big hits over the years, like 'If you Leave me Now', 'Hard to Say I'm Sorry', 'You're the inspiration', 'Look away' and many more. 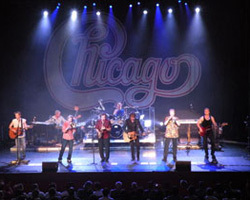 With more than 50 years of performing and 26 consecutive hit albums, Chicago the band Vegas is among the most successful rock bands. In fact, they managed to put out some of the most recognized songs of the '70s and '80s, such as "25 or 6 to 4' and 'Saturday in The Park'. The group has amassed more than $122 million in record, as well as many awards.Their last well known and successful album under the title' 'Now' Chicago XXXVI' released back in 2014 and included 11 new songs, that were actually recorded by the members of the band on the road while touring. They also won an 2 American Music Awards, a Grammy one gained also as star on the Walk of Fame in Hollywood. Their debut ablum was ready in 1969 under the title 'Chicago Transit Authority'. The famous rock group also is the the 1st rock band in the United States of American to actually to chart at Top 40 albums in 6 decades. If you think about it, this is actually pretty amazing. Chicago the band is a well known rock band in America and the whole world, which was actually formed in Chicago, Illinois, in 1967. The self-described " charged as well as experimental and ater moved to softer sounds, generating a number of famous ballads. Moreover, the famous group had a continuous flow during the decades of 1979 and 1980. It came secons only to the singles in Billboard. Chicago is actually the longest running and best selling groups in the whole world, which sold more than 100 million records all over the world. In fact, the band was the leading singles charting group in the United States of America, according to the Billboard, during the decade of 1970. They actually have sold over 40 million albums in the US , with 23 gold, 18 platinum, as well as 8 multi platinum albums. At the beginning of their music career, they formed a special group and shared the shame dream; to integrate the musical diversity from their home town and make out a new sound. Actually their dream came real and turned into amazing number of records sales, topping the 100,000,000 mark. In addition they made amazing number of gold and platinum records and became famous all around the world. The original group that was consisted of six musicians, who actually called themselves 'The big Thing' and made their hits and singles. Later, they added in their group Peter Cetera, who was a basists and made their first record in 1969, the well known double album was an amazing and rare one. Actually, it sold more than 1 million copies until 1970 . The album had great pop songs, such as 'Beginnings", "I'm a man', 'Question 67 and 68'. All these songs were later released as singles. Moreover, the band also made asecond album, under the title 'Chicago' which was consisted of a 13-minute suite and was composed by Pankow. Later on they released in 1971 the famous Volumes (I, II, III IV) which was consisted of a number of live performances . Many of their singles and albums followed the next years and were very successful and the band gained more fans. For example, in 1973, the 'Chicago VI' was the prime of a series of several albums, that included Brazilian jazz Laudir de Oliveira and Cetera managed to emerge as their lead singer in their group. Chicago VII was Later the 'Chicago VII' was tdouble-disc of the band that was released in 1974. The band in 2000 gave the authority to Rhino Records to record their songs, after having recorded with famous companies, like Warner Bros and Columbia a two-disc compilation, 'Only The Beginning', which actually spanned the amazing and successful career of the band. In 2010, Chicago made a number of tours all over the country, as well as to many places around the globe. In fact, one of their performances that took place in Illinois had an incredible success and was made a video for the HD channel. In addition, the band made an appearance at the American Idol with great success. So, don't miss the opportunity to see your favouriet rock band performing live at the Pearl Concert Theatre in Las Vegas! Remember also that you'll hear your loved songs and you will have the chance to sing and dance along with the famous rock band. If you happen to be in this amazing city (Las Vegas), grab the chance and enjoy all of them on the stage!